We were thrilled to see local artist Eric Clausen’s community mural recently come to life at Levitt Shell Memphis—a project that literally weathered the storm. This mural contributes to the rich public art legacy of the almost 80-year old band shell, which was created through a collaboration between the City of Memphis and the Works Progress Administration (WPA) in 1936. Originally scheduled for May 16 to coincide with Levitt Shell’s season opener, Community Art Day promised to bring the diverse Memphis community together to enjoy activities like craft-making and digital storytelling hosted by local arts organizations. Among the scheduled events was the painting of a mural adjacent to Levitt Shell led by local artist Eric Clausen, whose design had been selected from 22 proposals submitted to UrbanArt Commission, a Memphis nonprofit and the sponsor of the mural project. 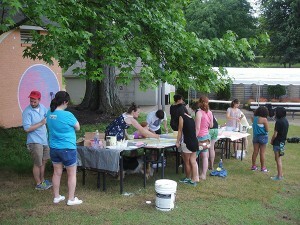 After rain caused Community Arts Day to be postponed, volunteers got together on June 6 to complete local artist Eric Clausen’s mural. However, a storm that arrived that weekend forced the postponement of both the planned concert, a collaborative performance between the Memphis Symphony Orchestra and the New Ballet Ensemble entitled Memphis Renaissance, and Community Arts Day as a whole. 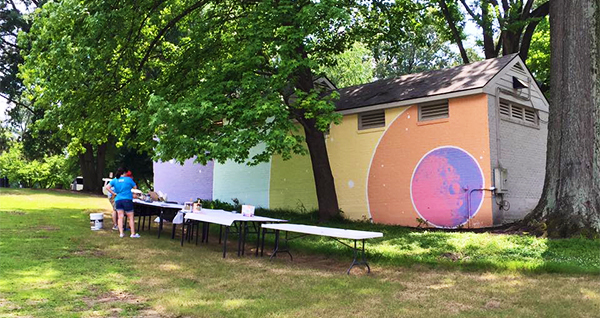 While the other Community Art Day activities will be rescheduled for later this summer, volunteers were able to assist Clausen in painting his mural on the afternoon of June 6. Levitt Shell lets the lights and sounds from its concerts leak out and travel through the trees of Overton Park and down the streets of Midtown. Shortly after the Shell was built, the Space Age and birth of rock ‘n roll were in full swing. Elvis Presley performed at the Shell underneath the very stars we were pointing our telescopes and rockets towards. There have been countless memories made in that very spot. While we think of these events as fleeting and long gone, they’re actually still happening. As you read this, radio and light waves from every event ever held at the Shell are still traveling through space and time, making our temporal experience of a concert forever new to distant worlds. 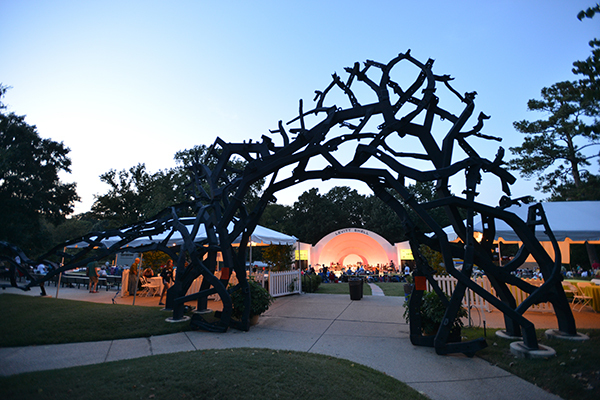 Designed by Birmingham, Ala. sculptor Chris Fennell, Steel Guitar was installed at Levitt Shell’s entrance in 2012. This wasn’t the first time that Levitt Shell has worked with UrbanArt Commission. The same partnership led to the monumental, recycled-steel sculpture Steel Guitar, which was installed as the gateway to Levitt Shell in 2012. The mural, which will remain at Levitt Shell into the future, not only celebrates Levitt Shell’s history—it has become a part of it. Be sure to stay tuned for the announcement of Community Art Day’s rescheduled date later this summer at Levitt Shell.